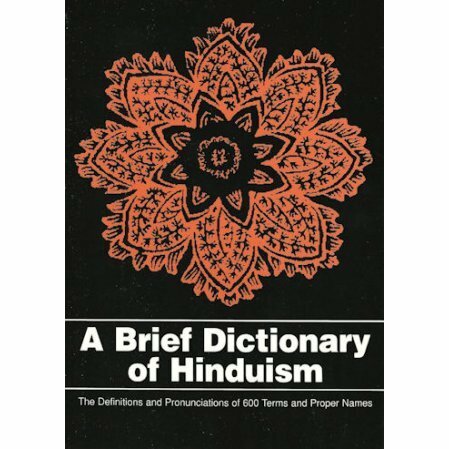 A handy dictionary and pronunciation guide to about 600 terms on Hinduism and Vedanta. 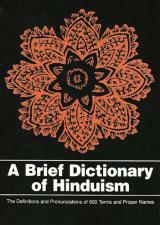 This small book is a handy dictionary and pronunciation guide to about 600 terms on Hinduism and Vedanta. These are the words a new student to Hinduism and Vedanta may encounter in his or her readings. Included are philosophical and religious terms, names from Hindu mythology, and a sprinkling of terms related to Indian psychology, history and social customs.Some terms from Buddhism are also included. The book is primarily directed to students of Vedanta, a branch of Hinduism, but it should easily meet the needs of those who read most basic books on Hindu philosophy. One may ask: Why bother with Sanskrit or Bengali? Why not simply use English equivalents? The answer is that this cannot be done. The reason any foreign words comes into a language is that it expresses an idea not easily expressed with the words available in that language. Such is certainly the case with the exact philosophical and religious terms with which Indian religion abounds. There is the English word soul, for example, If we were to use it place of Atman or jiva, gross misconceptions would result. Atman and jiva have technical meanings that "soul" cannot approximate. Previously titled Ramakrishna Vedanta Wordbook. I have at my writing desk this easy to understand 87 page glossary of 600 mainly Sanskrit terms and proper names. My method is first to consult the book I am reading because there is frequently a built in glossary or commentary such as in the Gospel by “M” or the Gita translated by Swami Chidbhavananda. This go to Brief Dictionary is beside my Oxford dictionary and usually meets my needs. My only suggestion is that it should have more entries.